On July 22, 2011, thirty-two year-old Norwegian Anders Behring Breivik massacred 77 people in Norway. Hollywood released the new Captain America film the same week. 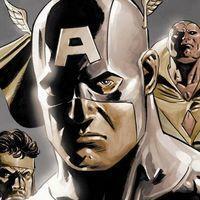 Some people see Captain America as ugly Americana at its worst; others think anyone who criticizes it should be killed. The savior story Captain America follows the earlier 2011 premier of Marvel Comic’s Nordic superhero THOR. Meanwhile, ordinary people of both developed and underdeveloped countries suffer more and more as the captains of industry profit from massive global high-tech warfare and the manufacture of misery. How do such seemingly benign Hollywood films affect mass psychology? How do they influence individuals? Is there any relationship between martyr-massacres and mass entertainment media? Some call the Nordic Aryan a psychopath. Others are calling him a savior. Is he a self-styled Norwegian version of Captain America? Captain America offers spectator-consumers the chance to yet again sit back and be taken for a phantasmagorical ride. The new Hollywood film is another forces of good versus the forces of evil production, where the goodest good guy is a white superhero whose scrawny body is technologically transformed into the perfect muscular male. Moral, good, manly, just, brave, caring, altruistic — all in a physical package that buckles women at the knees. He might as well be God.